As the winner of the Young Artist Instrumental Competition, Christoper will have the opportunity to perform with ONNY during its March concerts. "It is always a treat every year to hear these wonderful young artists perform a variety of great music," said Music Director Kenneth Andrews. "I look forward to working with Christopher Spinelli, our first-prize winner from Syracuse, on the Schumann A Minor Concerto in our March Concert." The James and Katherine Andrews Young Artist Instrumental Competition was established to inspire the young musicians of northern New York and beyond to reach their highest level of artistry. This competition is one of the few of its kind in the U.S. to offer both cash prizes as well as the opportunity to solo with a professional symphony orchestra. 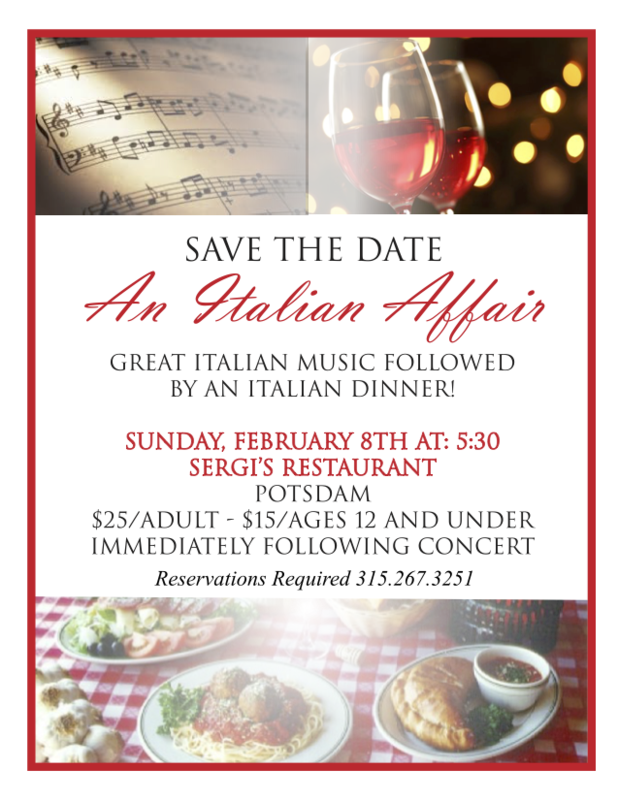 Enjoy an Italian dinner at Sergi's restaurant following the concert on Sunday, February 8th. $25 for adults; $15 ages 12 and under. Reservations are required. For more details, read the invitation. POTSDAM - Reservations are now being accepted for the Orchestra's annual Holiday Brunch & Silent Auction that will take place Sunday, December 7, 2015 from 11:30 a.m. - 1:30 p.m. in the Barben Rooms, Cheel Center at Clarkson University. The event has become a much anticipated holiday festivity; early reservations are encouraged as seating is limited. Attendees will enjoy live holiday music by friends and musicians of the Orchestra. In addition, there will be a silent auction and raffle featuring beautiful hand-crafted items from local artists, among other items donated by local merchants. Support the Orchestra of Northern New York at one of its most important fundraisers of the year. Tickets are $30 for adults (includes a $15 tax-deductible donation) and $17 (includes a $10 tax-deductible donation) for students, 12 and younger. Children under five are free. For tickets or more information, call Executive Director Kathy Del Guidice at 315-267-3251 or email onnybusiness@gmail.com. POTSDAM - High school students in Northern and Central New York are invited to participate in the 9th Annual James and Katherine Andrews Young Artist Instrumental Competition on January 31, 2015. Participants will received feedback from a panel of professional musicians. Cash prized will be awarded for the top three students. And the winner will be featured with the Orchestra in the March 14th performance of Fables, Fantasy and Folklore concert program. A non-refundable $50 application fee is required to be filed with a completed application by the January 16, 2015 deadline. For more information, contact Kathy Del Guidice, ONNY Executive Director, at onnybusiness@gmail.com or 315-267-3251. The Orchestra of Northern New York is pleased to announce the hiring of Kathy Del Guidice as Executive Director. She will oversee all management and operational activities for the orchestra. Ms. Del Guidice brings a wealth of experience to the position. Prior to this appointment, she was the Development Associate for the American Stage Theatre in St. Petersburg, Florida where she was involved with events planning, fundraising, and grant writing. A longtime resident of northern New York prior to her move to Florida, Del Guidice is well-known in this area for her many years of management as Executive Director of St. Lawrence Foundation for Youth and the highly acclaimed “Music Theatre North”. Del Guidice has a BA from SUNY Potsdam, and an MBA from Clarkson University. She and her husband, Richard, reside in Colton, New York. Welcome to the 27th Season! Welcome to The Orchestra of Northern New York’s 27th Season – Keeping the Music…LIVE! LIVE music is what keeps all types of music fresh, new and exciting. Our mission has been, and will always be, to bring you LIVE music performed by brilliant soloists and inspired professional musicians from Northern New York and beyond! Join us in our 2014-2015 season for a wide array of concerts and musical entertainment. Come experience why this Orchestra is considered one of the great artistic gems of our region, and why it was dubbed long ago, “One of the Sweetest Sounds in New York” by the I LOVE NEW YORK campaign. Whether your ears favor the magic of Mozart, the expansiveness of Brahms, the exhilarating power of Beethoven, the brilliance of music from the Baroque period, Holiday and Summer Pops or other great classics from the orchestral repertoire, we have something for everyone that will surely satisfy the most eclectic and discriminating tastes! We look forward to seeing you at our concerts during this exciting new season. THANK YOU for your great support over the years and for your help in Keeping the Music…LIVE! Maestro Kenneth Andrews and the talented musicians of the Orchestra of Northern New York have been Keeping the Music…LIVE! in a most wonderful way now for the past 26 seasons – with your help! We are excited and grateful to announce our 27th Season, opening in a most fitting manner with a program titled Music from the Heart. We extend our gratitude to each and every one of you for purchasing tickets to concerts, attending special events like the well-loved ONNY Holiday Brunch, contributing to our patron and endowment fundraising campaigns, advertising in our concert programs, and seeing to it that we receive the grants and other support vital to our survival. In particular, we wish to thank SUNY Potsdam and President Kristin Esterberg, Crane School of Music and Dean Michael Sitton, the Northern New York Community Foundation and Executive Director Rande Richardson, the North Country Arts Council and Board President Michael Miller, T. Urling and Mabel Walker, Massena Music Friends and President Paul Haggett, and the New York State Council on the Arts for their belief in and support of our mission to enrich the quality of life in northern New York and southern Ontario through live performances of orchestral music by outstanding musicians and to emphasize the engagement of area youth in the appreciation of music. As we look to this season and seasons to come, we continually seek ways to enhance the relationships between artistic scope, executive leadership, business management, volunteerism, and finances. Our intention is to function in a manner that reflects clarity and stability worthy of your trust and continuing support. If you are interested in becoming part of our operation, or if you have suggestions on how we can better-serve the communities of our region, I invite you to contact us through our website: www.ONNY.org. In the mean time, thank you for the part you play in Keeping the Music…LIVE! Update: The raffle has now closed. Information regarding the 2014-2015 Season Raffle will be posted when available. Enter now for the chance to win any of the prizes below! Winner receives a baton, conducting lesson from Maestro Andrews, and the opportunity to conduct the Orchestra for one piece at the "Bravo Broadway" concert in July 3, 2014 in Hosmer Hall. *Drawing for Maestro prize will occur immediately after intermission at the April 26th concert. Ralph Hastings, ONNY Board Member, has been recognized as a "Leading Professional of the World 2013"! Congratulations, Ralph! The Research and Editorial Departments of the International Biographical Center, Cambridge, England, has considered, nominated, and named Ralph B. Hastings as a member of the international Biographical Center. His name will be included in its biographical publication "Leading Professionals of the World, 2010." Each year the IBC investigates from all disciplines and from a wide variety of sources, names to be included in its reference books and its awards program. Each recipient has made a significant contribution in their field to engender influence on a local, national or international basis. Retired from the music faculty of Malone Central School and as organist of Malone's First Baptist Church, Hastings received degrees from Onondaga Community College, Syracuse (A.A.S.) and the Crane School of Music, SUNY Potsdam (B.S., M.S., M.M.) in music education and music history and literature. A member of the American Society of Composers, Authors, and Publishers, Hastings has published compositions with Belwin/Mills Columbia Pictures Publications (Alfred Publishing), Abingdon Press, and Wayne Leupold Editions. He is also a member of the St. Lawrence River Chapter of the American Guild of Organists, serving as dean; SUNY Potsdam Chapter of Phi Mu Lambda, the American Academy of Distinguished Graduate Students, the Potsdam Alumni Association Board of Trustees, and is serving as president of the Julia E. Crane Alumni Association, Board of Trustees. He has also served as chairman of the Helen H. Hosmer Excellence in Music Teaching Award Committee and has collaborated with SUNY Potsdam's Center for Life-long Education and Recreation in teaching "The King of the Instruments: Introduction to the Organ for Use in Worship." Hastings serves on the Board of the Orchestra of Northern New York, and has previously been named to Who's Who in American Junior Collegees, Who's Who in America, and Who's Who in American Education.